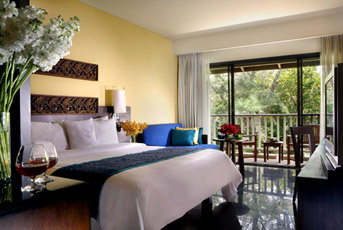 Save 25% off best available rates at the Sheraton Krabi Beach Resort when you stay 5 nights or longer. After applying the discount, nightly rates start from THB3,750 (USD120) for a Garden View Room and THB4,540 (USD150) for a Deluxe Sea Facing Room. Rates include daily breakfast. A 10% service charge and 7% local taxes are additional. This promotion is available until December 24, 2012. Exact rates vary by date and may be higher during peak periods. Rates are based on single or double occupancy. This promotion requires full pre-payment by credit card and no changes or cancellations are permitted. The Sheraton Krabi is a 5-star beach resort along the Andaman Sea. The resort offers 240 guestrooms that blend Thai style with modern amenities. All guestrooms feature premium bedding, TV with international channels, mini-bar, and a private balcony overlooking the tropical gardens or sea. Resort facilities include beachfront infinity pools, water sports, a day spa, kids club, fitness center, tour desk, and restaurants. Visit the official Sheraton Krabi Beach Resort website for more information or to make an online booking. The resort can also be contacted by calling (66) 75 62800 or emailing reservation.krabi@sheraton.com.